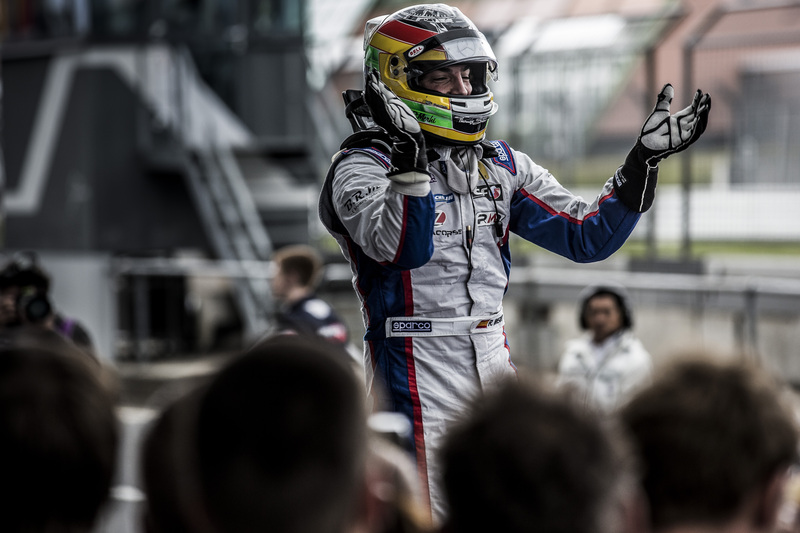 It is safe to say that it had been something of a barren couple of years for Roberto Merhi. A former champion in the Formula 3 Euro Series category and race winner in Eurocup Formula Renault 2.0, the Spaniard decided upon a sidestep to the DTM with Mercedes. It was not unreasonable of course. Monies for a stint in the GP2 Series can be hard to come by, especially when one looks at the numbers of Euro demanded around 2012/13. On top of that, when a team – a factory team no less – offer up a paid position to drive one of their cars in a category like DTM, there are precious few who would or could say ‘no’. That Merhi’s two years in DTM turned into a disaster, lifted by only a few points finishes, appeared to greatly shake the Spaniard. His sole podium came at the Hockenheimring at the end of last season, but by then it was far too late. It was clear that the Mercedes was not the manufacturer to be with in DTM – regardless, the 23-year-old entered 2014 a free agent. Tests for both Formula Renault 3.5 Series and GP2 teams in the off-season eventually led to a drive with the Zeta Corse team and Merhi has paid the team with some handsome results. Indeed, in these opening six weekends of FR3.5, Merhi has done much to rebuild his confidence and with it his reputation. The first podium at Monza was a welcome start, but apart from a poor couple of races at Spa-Francorchamps, Merhi continued to collect highly valued points; however it is at Moscow and the Nürburgring where the Spaniard has turned it on. Suddenly in the space of four races, Merhi has taken two victories, a 2nd place and a 4th and the momentum is his and while the title still looks good for Carlos Sainz Jr, there can be little doubt that the former-DTM racer is getting back on his feet. “We are getting stronger and stronger at each meeting,” said the Race Two winner on Sunday and of that, there is no doubt, but what’s next? It may be difficult, if not impossible at this point, for Merhi to secure anything that will get him remotely close to Formula One – that door may also be locked – so where does the Castellón de la Plana native go from here? Carlos Sainz Jr took his fifth Formula Renault 3.5 win of the season during Saturday’s race at the Nürburgring, despite a late rain shower placing a spanner in the works. 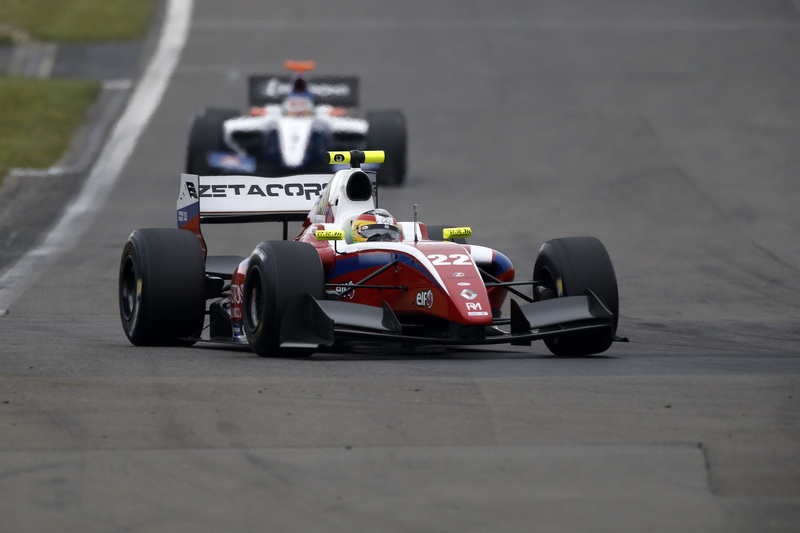 The Spaniard headed an on-form Roberto Merhi and Sergey Sirotkin, while title protagonist Oliver Rowland finished 4th. For the sixth time in 2014, Sainz Jr had taken the pole position spot, but had one read the DAMS driver’s comments during the early part of the weekend, one might be forgiven for thinking the teenager’s response a touch conservative. Once the lights were out, Sainz Jr led for the duration from Rowland, gently easing away from his British rival; however, as almost typical for the classic German circuit, a quick rain shower came close to turning the race on its head in the closing tours. 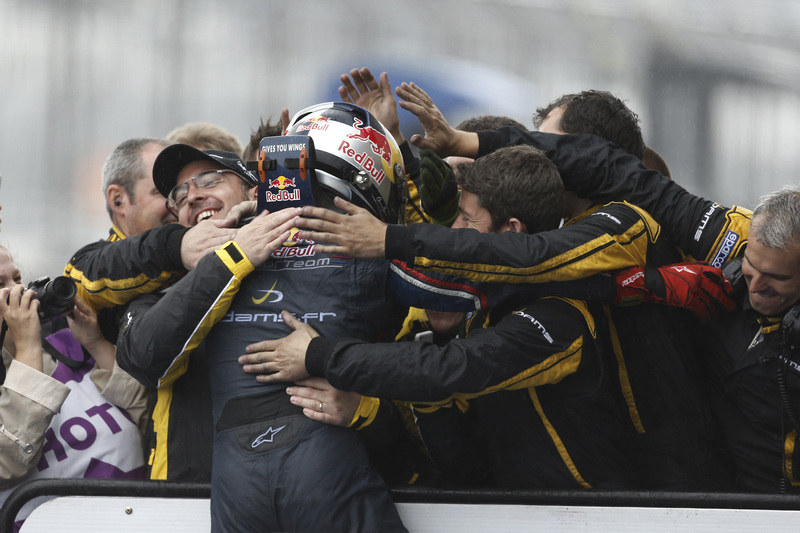 As his title rivals fell away, Sainz Jr clicked into championship mode and secured full Saturday points in the process. “I had to bring the car home because I wanted to avoid making a mistake at all costs.” By Saturday evening, that lead had become significant. Sainz Jr’s cause was helped by Rowland falling back late on, through no fault of his own it must be added. The Briton could not keep up with Sainz Jr through the race; however 2nd place would still have offered a credible payout, had it come his way. With each tour, it appeared as if the 21-year-old Rowland had done enough for the runner-up position, while at the same time watching his mirrors for an attack from Merhi. Rowland, meanwhile, lost ten seconds over the final pair of tours, but he still had an enough of an advantage to stay ahead of Marlon Stöckinger (5th), who in turn edged Matias Laine (6th) and Pietro Fantin (7th). Oscar Tunjo took 8th place just ahead of Zoël Amberg (9th) and Marco Sørensen to secure his second points finish of the season. It was more than Pierre Gasly managed. The Frenchman’s title hopes took a big hit, when he could do no better than 20th, following a clash with Roman Mavlanov on the lap two; although one could argue Gasly’s lowly qualifying position of 17th did not aid matters. Come Sunday afternoon, Merhi jumped up to 2nd in the title challenge, following a disastrous day for the main protagonists. From pole at the Nürburgring, Merhi led for the distance from the returning Matthieu Vaxivière and Marlon Stöckinger in a safety car interrupted event. Pole always helps, as does a good getaway, but it helps a little more when your rivals err. Merhi originally drew away from Tunjo, Sainz Jr and Rowland; however as Rowland ran slightly deep into the tight turn one, Tunjo was pitched into the apex and then Rowland, who in turn collected Sainz Jr. Although neither Gasly nor Rowland held on to 2nd in the points, Sainz Jr was disappointed to have dropped valuable scores in what was a silly incident. “I got a good start, went to the outside to challenge for the lead but then got hit hard and that was the end of my race. I woke up with a 57 point lead and now I am going to bed with a 39 point lead so that is not a good day.” If nothing else, one could call the incident clumsy. And possibly very expensive. It was not the sole circus of carbon fibre on the opening tour – moments later at turn two, another collision between several cars removed Beitske Visser, Meindert van Buuren and Matias Laine from the event. Stöckinger had to work hard to keep Sirotkin at bay for 3rd and 4th places during the pitstops. The Russian stopped a lap prior to Stöckinger, but was unable to turn that into an advantage, with the 3rd place man defending vigorously once he emerged from the pits. Once settled, Stöckinger pulled away from Sirotkin, leaving the latter to fend off the intentions of Amberg and Monaco winner Norman Nato; however neither Amberg nor Nato could press an error from Sirotkin – across the line, the Sirotkin-Amberg-Nato train were covered by just 1.4s for 4th-6th places. Will Stevens took 7th, propping up a quiet weekend. The Briton only just edged out Gasly, who rose to 8th from the back of the grid, following the opening lap melee. Jazeman Jaafar assumed 9th for ISR, while Will Buller ran the Malaysian close in 10th spot. Of note, Tech-1 Racing fielded two cars for the first time this season, GP3 Series regular Alfonso Celis Jr teamed up alongside Sørensen. Comtec Racing returned to the FR3.5 fold with Cameron Twynham behind the wheel – the team’s third driver in only their fourth round this year. Following the recent short burst of races, the Formula Renault 3.5 Series goes on a long break, before returning at the Hungaroring for the seventh round in mid-September. The field will have much to think about over the following weeks, especially Gasly and Rowland who have both now lost out to Merhi in the standings, but is Sainz Jr worried..? Alas, there are six races remaining.